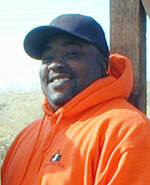 For Big J Construction, based in Medford, Ore., good fences also provide good business opportunities. Owner Jesse Williams III, who established his firm in 1997, is delighted with the opportunity to double his workforce, increase Big J’s revenues and build upon future contracting opportunities through the state’s bridge program. 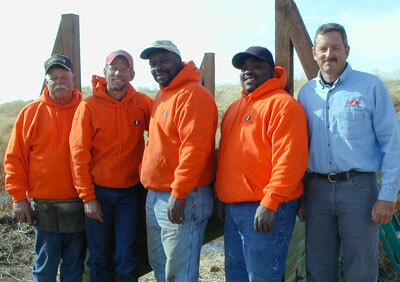 Big J Construction, from left: Joe Christensen, superintendent; Mark Lecher, operator; David Smith, laborer; Jesse Williams III, owner; and Jim Wamboldt; manager. As a subcontractor to CH2M HILL, Big J secured a $142,000 contract to install fencing along sections of I-5 from Roseburg to Sutherlin in 2005. In 2006, the firm received a $97,000 contract to install additional fencing in the same area. Big J is among a number of minority and women-owned firms across the state that are involved in the OTIA (Oregon Transportation Investment Act) III State Bridge Delivery Program. The $1.3 billion bridge program is set to repair or replace nearly 300 bridges over a 10-year-period. The boom in highway and bridge construction projects across the state has created a huge demand for skilled and trained workers in the trades. In fact, when the Oregon Department of Transportation started the bridge program in 2003, the nation was anticipating a shortage of construction workers that was only expected to get worse as baby-boomers who work in construction entered retirement. The agency recognized that it needed to take action. To attract new people and businesses to work on bridge program projects, ODOT set “aspirational” targets in contracts for hiring disadvantaged, minority, women or emerging small business firms. It also implemented its Workforce Development Plan, which focuses on recruiting and qualifying individual workers. The two-year pilot runs through July 2007. Continuing to expand its efforts to include businesses that haven’t worked with ODOT before, the agency recently implemented its Small Business Initiative. A Small Contracting Program for Professional and Technical Services is part of this effort, which began in October as a pilot program in the Portland Metro area. According to Karen Jones, OTIA III Bridge Program Communications and Stakeholder Relations Manager, the Small Contracting pilot is a simplified procurement process that will prequalify firms to be selected as prime consultants for ODOT contracts valued at $75,000 annually or less. Funded by the 2003 Oregon Transportation Investment Act, the bridge program is repairing or replacing hundreds of aging bridges across the state while stimulating the state’s economy. As part of that effort, Oregon Bridge Delivery Partners (OBDP), ODOT’s program management firm for the bridge program, prequalified approximately 120 specialty contractors for work on the program. About half of those firms are owned by minorities or women, says Jones. “Together, these tactics will ensure that established contractors will have the workers they need, through the Workforce Development Plan, and that up-and-coming businesses will have opportunities, through the Small Business Initiative, to compete for ODOT contracts,” she says. Michael Cobb, Director of ODOT’s Office of Civil Rights, lauds the bridge program’s success with providing opportunities for minority- and women-owned small businesses, but knows there’s still a lot more to be done. Since taking on the reins of the Office of Civil Rights in March 2006, he has been involved in spearheading efforts to deepen the agency’s connections with small businesses. “We’re determined to help eliminate barriers for small business owners. Based upon initial feedback from different groups, we’re determining ways to enhance access to information,” Cobb said. The office also is working on developing a mentor-protégé program that will pair up prime contractors with small businesses. “The program will allow people to gain experience with being a prime contractors and learn how to do business with ODOT. Protégé contractors benefit from the program because they get work, and learn how to work effectively,” said Cobb, who has more than 30 years’ experience in public administration and has spent 18 years in management positions for the New York State Metropolitan Transportation Authority. In addition, a disparity study evaluating small business access and opportunity issues is scheduled to begin in January 2007. Statistical and anecdotal data will be evaluated during the course of the study, said Cobb. With the increased capacity and larger workforce, Williams elaborated on what this means for Big J. “As our focus has changed this year to a wider variety of heavy civil engineering projects, we are looking forward to meeting the challenges of increasing the complexity of our project scope,” he said.